Tomato & Black Bean Quesadillas – Jay Luker – Really? ... Wow. Leftovers from dinner last night. 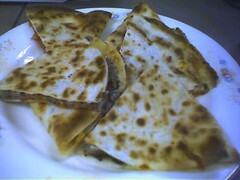 These quesadillas feature refried black beans, tomatoes from the garden and grated jack cheese. They were “grilled” in a fantastic cast iron pan I picked up at the Todd Farm flea market several years ago.